In December last year, Samsung launched the Galaxy Grand, a smartphone which looked a lot like the Galaxy S3, just with a slightly larger touchscreen. However, the Galaxy Grand had a more basic spec, keeping the price down to a sensible level. 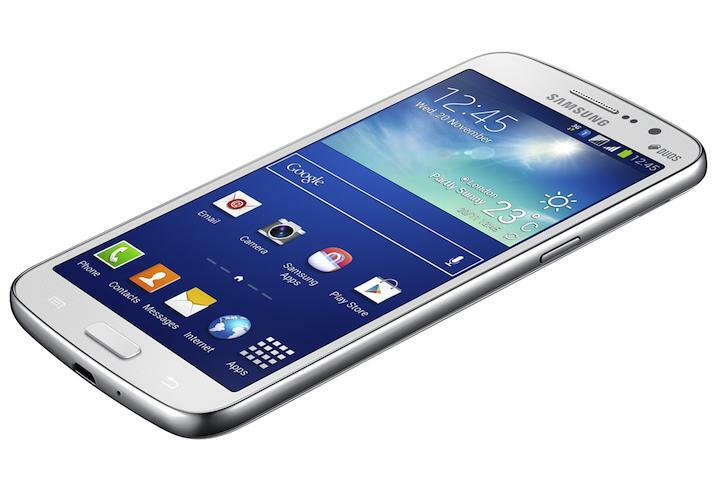 Now, almost a year later, Samsung has announced the Galaxy Grand 2, and guess what? This time it looks like a cross between the Galaxy S4 and the Galaxy Note 3, but with a lower more cost effective spec. The Galaxy Grand 2 has a 5.25-inch TFT touchscreen – no Super AMOLED goodness here – with a 720p resolution. This is an improvement over the previous generation, which had a 5-inch, 480 x 800 panel. Inside the phone, a 1.2GHz quad-core processor provides the drive, with 1.5GB of RAM to command. Samsung hasn’t mentioned which processor it has used in the Grand 2. Samsung has given the Galaxy Grand 2 the same leather-look rear cover as the Galaxy Note 3, which depending on your own personal view, is either really cool, or a bit tacky. The phone will be sold in black, white, or pink color schemes, and weighs a hefty 163 grams with a thickness of 8.9mm. An 8-megapixel camera lens sits at the top of the rear panel, flanked by an LED flash and the phone’s speaker, while around the front above the screen is a 1.9-megapixel camera. Other features include Wi-Fi, GPS, Bluetooth 4.0, 3G HSPA+ connectivity, and a 2,600mAh battery. Samsung has used Android 4.3 Jelly Bean as the Galaxy Grand 2’s operating system, which will presumably help it connect to the Galaxy Gear smartwatch, and covered it in TouchWiz. Samsung hasn’t said when or where the Galaxy Grand 2 will go on sale, only that it will be producing a dual-SIM version alongside the regular model. We’ll keep you updated.